Gilbert Dyer: An Early Blake Vendor? Robert N. Essick’s first sales review was for 1971; that year, he detailed the sale of “Tiriel Supporting Myratana” and “Tiriel Leaving Har and Heva” for $15,420 and $9766 respectively. This year, he records the auction of another Tiriel drawing for £170,400 (including fees). J. B. Mertz (jeffrey_mertz@hotmail.com) is writing what he hopes will be the last chapter of his doctoral thesis on William Blake and the circle of Joseph Johnson. He has published articles on Blake in this journal as well as in Notes and Queries and Modern Philology. 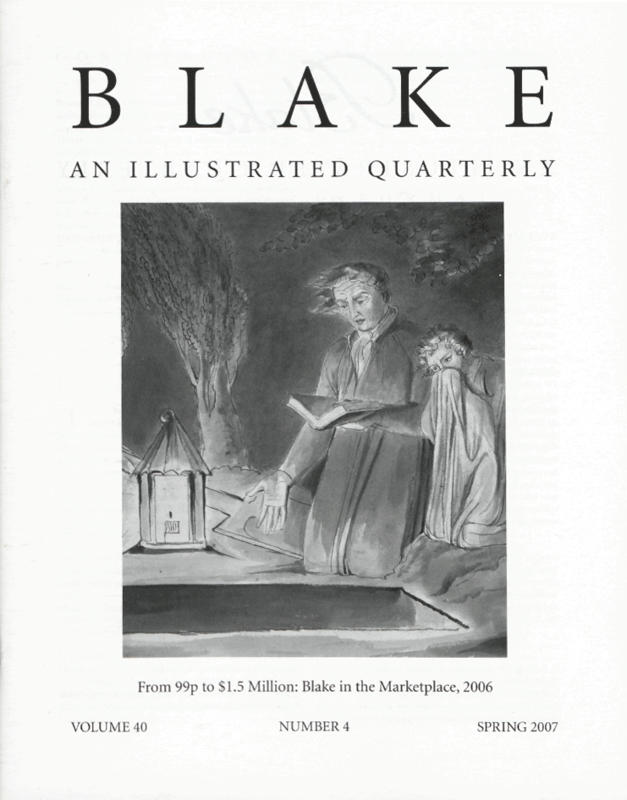 G. E. Bentley, Jr., writes on Blake’s bibliography, biography, and texts. Morton D. Paley is completing a book on Samuel Taylor Coleridge and the fine arts. Cover: William Blake, A Father and Two Children beside an Open Grave at Night by Lantern Light, detail. See pages 120 and 123. Photo courtesy of Sotheby’s New York.